Hey all! For today's post, we had to do a mani inspired by another blogger, and I went for the wonderful Sarah from Chalkboard Nails: http://www.chalkboardnails.com/2012/10/blue-and-pink-gradient-dots-tutorial.html?m=1. I based my mani on this tutorial! 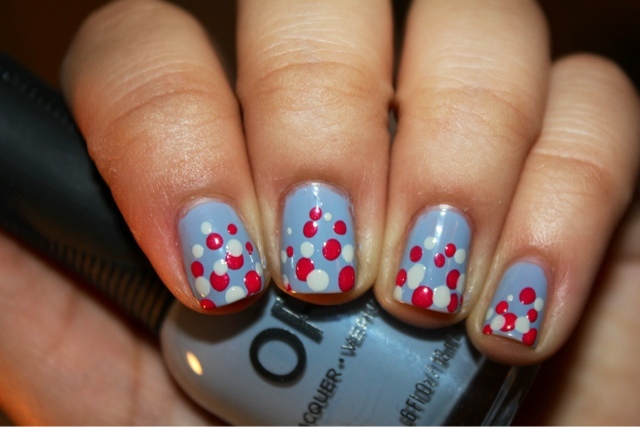 I used Orly Boho Bonnet as the base, and Zoya Yana and OPI My Boyfriend Scales Walls for the dots:) Enjoy! new to me. Anyways, I'm certainly delighted I stumbled upon it and I'll be book-marking it and checking back regularly! Aw this is so cute! Love the inspiration! I love this! Chalkboard Nails is one of my favorite bloggers, too! Really pretty! Love the colors you used. So adorable, Sarah--these colours are just perfect! Love this. The base colour is so pretty!